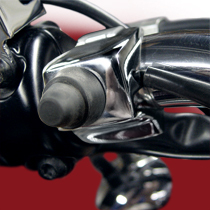 National Cycle Spotlight Bars not only look great on your bike, but they are also a considerable safety feature. Their 35-watt halogen bulbs light up the night on those long, dark roads, and they make you more visible to oncoming traffic. We manufacture a complete line of Spotlight Bars and guarantee a perfect and complementary fit with our windshields and our Chrome Lower Deflectors. * Not Available for International Sale. 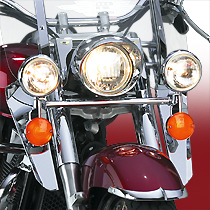 We manufacture a complete line of Spotlight Bars and guarantee a perfect and complementary fit with our SwitchBlade®, Heavy Duty™ and Dakota™ 4.5 Windshields as well as with our Chrome Lower Deflectors. Our brightly chromed steel N9005 Spotlight Visors really make your National Cycle Spotlight Bar a thing of beauty. They also complement most OEM accessory headlight visors. 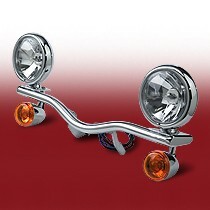 N9001 Spotlight Visors are sold in pairs and fit all National Cycle Light Bars. For power at your fingertips, wire your National Cycle Spotlight Bar to our N9001 Light Bar Switch. Your Light Bar can then be turned on and off at will, regardless of whether your headlight is on high beam or low beam. 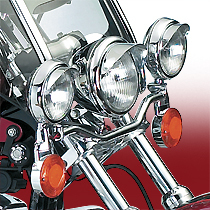 High-strength steel finished in National Cycle quality bright chrome. National Cycle Spotlight Bars come fully assembled with turn signals and completely pre-wired for no-hassle installation. All mounting hardware is provided. Approved for use in Commonwealth of Virginia, DOT approved, and European "E" Mark Approved.